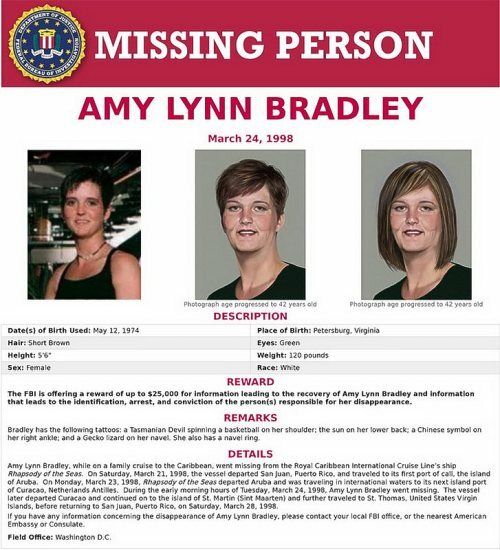 WASHINGTON, WILLEMSTAD - A reward of up to $25,000 is available for information leading to the resolution of the case of missing Virginia woman Amy Lynn Bradley, who was last seen while on a cruise in 1998. That evening, Amy was out at the disco with her brother, other passengers, and crew socializing and having a great time. In the morning, when her parents and her brother woke, Amy was gone. Amy’s brother Brad was the last family member to see her. “Myself and my parents have had to endure a lot of sadness, but the last thing that I ever said to Amy was, “I love you,” before I went to sleep that night,” said Brad Bradley. Many details of Amy’s night out are missing, so even the smallest bit of information could help agents solve her case. We’re not going to give up investigating what happened to Amy. We are Amy’s voice; we are her true advocate. Report tips to your local FBI office or American Embassy or Consulate or online at tips.fbi.gov.